Want to have perfectly shaped eyebrows without having any stray hairs to ruin your look? How about not wanting any light or dark coarse hairs or even grey hairs around chin and lip area? What about those pesky fine hairs that just won’t go away? There is a solution for all those and the best part is that it’s safe, convenient, and practically pain free. It’s Electrolysis! Did you know that Electrolysis has been around for nearly 60 years? 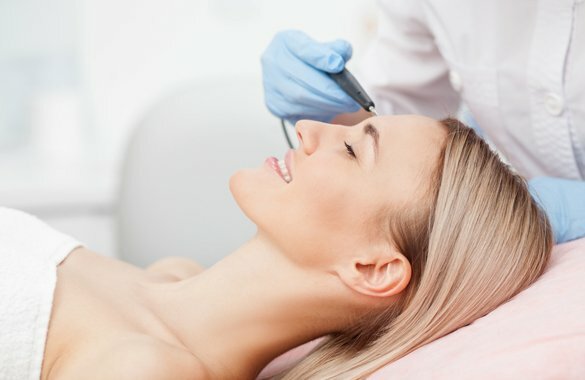 It was dominant form of hair removal before the laser became popular. Electrolysis is a method of permanent hair removal. By applying a small amount of electric current to the bottom of a hair follicle the root of the hair is coagulated. Since human hair grows in cycles – repeated treatments are necessary. It is important to catch the hair in the active growth (anagen) stage when it is attached to the bottom of the follicle and the root becomes accessible. Electrolysis targets individual hair, thus allowing much more control and precision in Permanent Hair Removal. It becomes especially important in permanent eyebrow shaping. Earlobes are another area, where electrolysis shows its advantages over laser. In order for the hair to be permanently removed, it must be treated while the hair is still attached to the dermal papilla. This occurs in the anagen stage of the hair growth cycle. Unlike Laser Hair Removal Systems, Electrolysis has little to no limitations as far as what hair type and skin type can be treated. Electrolysis can treat white hair, fine hair, red hair and grey hair; hair types that Laser cannot treat. Electrolysis is safe to use on all skin types. With Electrolysis, the visible hair is used to locate the follicle opening. A very fine filament is inserted into this opening and then guided to the bottom of the hair follicle where the papilla is located. Once in position, a small amount of current is applied. This action cauterizes the papilla and makes it permanently unable to regenerate hair. At Laserlicious, we use the latest in Electrolysis technology the Evolution 5HD from Silouhette Tone. This enhanced system provides clients with complete comfort, safety and result driven treatments.